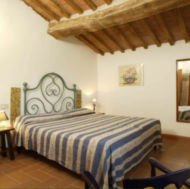 Il Tigliolo is situated in the heart of the Val d’Orcia between San Quirico d’Orcia and Montalcino. 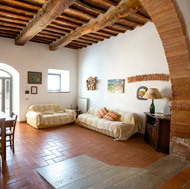 Nestled in the Tuscan countryside, it is a splendid example of carefully restored 19th century rural architecture. The property boasts 6 apartments, each with separate entrances and private outdoor areas, and furnished in a comfortable style reflecting the architecture and environment. Guests have access to a large garden with a 7x15m swimming pool, areas for table tennis and bocce ball, a barbeque, laundry, and lounge for recreational and cultural activities. 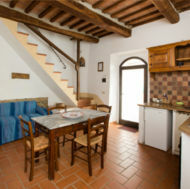 The proverbial hospitality of the hosts will treat guests to an unforgettable holiday set between the past and present, among beautiful città d’arte (“art cities”), breathtaking landscapes, and soothing thermal baths. 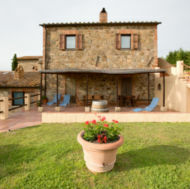 Nearby is Bagno Vignoli, famous for its thermal baths and where it is possible to enjoy a relaxing swim in both summer and winter; Montalcino, renowned the world over for its Brunello wine; and Pienza, “the city born from thought of love and a dream of beauty” as Giovanni Pascoli wrote. A little further away are other spectacular places worth visiting: Montepulciano, Castiglione d’Orcia, Rocca d’Orcia, l’Abbazia di Monte Oliveto, Siena, San Gimignano, Monteriggioni, and Castellina in Chianti. 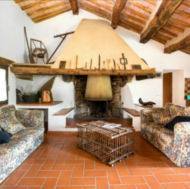 Il Tigliolo is the ideal place to spend time immersed in nature while enjoying delicious food and wine from the region.